So which one’s The Fanglord and which one’s Sir Dark Invader? Not that it’s some big riddle that must be solved in order to enjoy this steady set of country inflected rock tunes. But it does get one thinking. Over the last few years Richard Buckner’s work has lacked a certain punch. I don’t want to say that he’s phoning it in, it’s more like he’s trying too hard to recreate a legend to which he feels obligated. Dents And Shells was a minor success, but if you’re like me, it didn’t really stick to the ribs the way you were hoping. It got listened to a number of times and then somehow found its way to the bottom of the stack. Buckner seemed to be very conscious of being Richard Buckner on that record, if that makes sense. His reputation as a highly literate lyricist who can translate the immediacy of a broken heart into a thousand kaleidoscopic pieces each reflecting a different aspect of hurt, betrayal, recrimination, and abandonment, seemed to weigh heavily on that record. Buckner’s vocabulary, usually an amalgam of syllabic oddities anyway, was unusually unapproachable even for him. Instead of creating a tone that reflected his internal struggles, always his greatest strength, Dents And Shells was a carefully constructed wall between him and the listener. I found myself thinking, lighten up just a bit, give me something to grasp on to and let me into these songs. Dents And Shells inapproachability makes Buckner’s project with The Mekon’s Jon Langford all the more precious. Recorded in 2002 at Mekon Sally Timm’s apartment in Chicago, Sir Dark Invader vs. 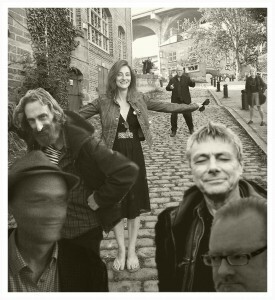 The Fanglord clearly shows Buckner benefiting from working with The Mekons’ Jon Langford. The disc’s nine songs are evenly split: three written by Langford, three by Buckner, and three collaboratively. As might be expected from a project involving Langford things are played loose and fast. There isn’t a weepy ballad in the bunch. Instead Buckner and Langford concentrate on getting songs on to tape (or hard drive) without too much fuss. The two play all the instruments with a touch of help from John Rice of the Pine Valley Cosmonauts on mandolin and guitar. Album opener “Rolling of the Eyes,” one of the jointly written numbers, is a rousing rock song full of sizzling electric guitar work and a thumping fuzzed out bass line. It’s a take no prisoners stomp that sets the tone of the record as one of unabashed (if sloppy) fun. You can almost hear the beer bottles falling off the amps. ”Nothing To Show” is a sweet duet between Langford and Buckner. As they trade off direct, plainspoken verses it’s clear that Langford was the lyricist on this one. The remarkable thing about the song is not how well these two gruff voices fit together (and that’s pretty remarkable), but how expressive Buckner’s voice is when he’s not forcing the words through a filter so intensely personal that we can’t even recognize the landscape, much less identify with it. Being forced to walk through someone else’s lyrical musings frees his voice to dance through his verses without a trace of self-consciousness. A twinkling mandolin anchors Buckner’s “Sweet Anybody.” The lyrics are classic lost love Buckner as he chases a “sweet anybody” through the song, hiding in sound, searching the night, before discovering the windows that pop up in so many of his best songs “finally gone.” It’s everything that Buckner does right. It may be too easy to read into, but it must be assumed that Langord to some degrees is responsible for prying out such beautiful insight from Buckner. While this project is certainly a collaborative effort, it’s Buckner who seems to dominate the proceedings. His deeply affecting voice easily muscles Langford’s reedier strains to the side. It’s also clear that Langford’s presence throughout Sir Dark Invader vs. The Fanglord is what enables Buckner to play things far looser than he has on his recent solo work. The collaborative “The Inca Princess,” for instance, ends with Buckner and Langford laughing into the song’s decay. It’s a refreshing bit of humanity and typical of the album’s feel. Buckner’s closing song, “Do You Wanna Go Somewhere,” had it appeared on Dents And Shells would have been an album highlight. It’s warm and steady and too short at two minutes and forty-one seconds. But it’s a reminder that Sir Dark Invader with all his baggage and idiosyncratic habits can make us believe in his weeping and may yet again. In one corner you have Richard Buckner, aka Sir Dark Invader, the Devotion + Doubt Demolisher, the Alt-Country Annihilator. And in the opposing corner is Jon Langford, aka the Fanglord, aka the Mekons Menace, the Waco Brothers Brawler. It’s a match made not in heaven, but in Sally Timms’s Chicago apartment, where in 2002 Buckner and Langford recorded eight of the nine songs on this one-off collaboration album, released on Langford’s Buried Treasure Records. The title suggests there may have been some friendly competition involved, which seems almost inevitable given their distinct styles. Sir Dark Invader vs. the Fanglord pits Buckner’s melting drawl against Langford’s grainy vocals; Buckner’s abstracted, introspective songwriting against Langford’s demonstrative, outward-looking lyrics; Buckner’s ragged beard against Langford’s trimmed mustache. This amiable musical friction enlivens every song: pounding drums and punchy basslines jab at welterweight guitar melodies, and over the melee, Buckner and Langford move easily between lead and backing vocals and trade off instruments and solos almost on a whim. As a result, songs like the opener “The Rolling of the Eyes” and “The Inca Princess” generate brawling momentum– the kind seldom associated with Buckner’s solo material– while tracks like “Nothing to Show” and the closer “Do You Wanna Go Somewhere?” sound battered and worn, but not necessarily defeated. The album is a volley of contradictions, a tossed-off collaboration (shelved for almost three years) that never sounds haphazard. The lighthearted aspects of the project– songs like “The Inca Princess”, the comic-book aliases, the photo-booth snapshots of both men that decorate the pixilated packaging– disguise the gravity of the songs. “Nothing to show for the things that I’ve done,” Langford sings on the ruminative “Nothing to Show”, “There were places to go, and I had to choose this one.” Buckner takes over for the second verse, expressing an equally world-weary remorse. If they’re pugilists on other songs, here they sound like hard-timers: singing “We’ll be lucky to leave/ Lucky to leave with our lives”, they sound like they’re holding each other up, two drunks stumbling home from another long night at the bar. By contrast, the conflicted lullaby “No Tears Tonight” and the abruptly abandoned “Do You Wanna Go Somewhere?” parse the isolation and the inspiration of a life devoted to music. “I wanna wrap you up in music,” Langford sings, then admits, “But we both know that I got nothing/ Spent too much time playing in bands.” Taken together, these two tracks comprise a twist ending of sorts, revealing that Sir Dark Invader and the Fanglord have been fighting on the same side all along, battling the spectre of loneliness. The mix of celebration and commiseration on the album suggests a draw. Å tenke seg den sordinerte og introverte Richard Buckner kollaborere med den meir støyande og geskjeftige Jon Langford høyrer kanskje ikkje med til dei mest opplagte av tankar. Buckner har sidan midten av 90-talet levert sine nedstemte funderingar kring det problematiske kjærleikslivet. Når han er på sitt beste, med låtar som Pull og 4am frå Devotion + Doubt (1997), skapar han tonepoesi av det riktig så utsøkte slaget. Nå har han vel etter den tid sjeldan vore oppe på det nivået. Ja, kanskje kan vi skulda han for å ha hatt ein litt vel einspora innfallsvinkel både tematisk og musikalsk. Likevel har det aldri vore bortkasta tid å søke selskap med ei Buckner-plate. 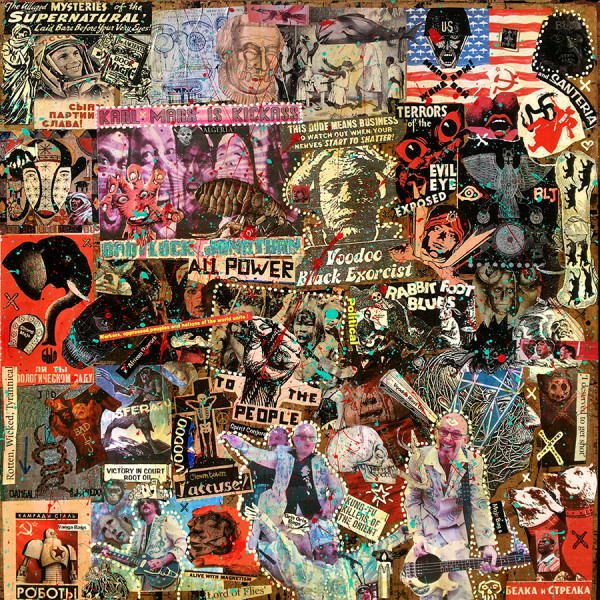 Jon Langford har ein musikalsk historie tilbake til 70-talet. Då var han med å starta det høgoktane og stadig sjangerskiftande bandet Mekons, saman med nokre medstudentar på universitetet i Leeds. Etter at han flytta til Chicago på 90-talet har den rufsete countryrock-gjengen Waco Brothers vore eit stadig tilbakevendande prosjekt. I tillegg til musikken har han også skapt seg eit namn som ein habil biletkunstnar. Han er ein produktiv fyr, så musikk, bilete og teiknestrips med Langford sin signatur kjem tett. Men kvantiteten er vel kanskje meir imponerande enn kvaliteten. Sjølv om han saktens har skapt ein del saker av fascinerande karakter også. Seinsommaren 2002 hamna desse to karane på mystisk vis opp i kåken til Sally Timms (ei dame som har sunge med The Mekons). Her presenterte dei nokre eigenkomponerte songar for kvarandre, fant fram innspelingsutstyr, litt instrumenter og hanka tak eit par medhjelparar. Etterkvart skreiv dei til og med eit par-tre låtar saman. Når seansen var vel overstått vart det innspelte materiale liggande å samle støv. Heilt til Langford no har funne det passande å gje det ut på sin eigen label, Buried Treasure. Med Langford-illustrert cover presenteras opplegget som Sir Dark Invader vs Fanglord. Så kan ein jo gjette kven som er kven. Vel, eg vil tru at oddsen er skrøpelig på å linke Buckner mot den svartsynte mørkemannen og Langford mot riddaren på den kvite hesten. Sjølvironien er avgjort til stades i rikt monn, og det er ein ledig og upretensiøs innstilling. Det som manglar er vel litt substans, samt dei verkelig store låtane. Dei har nok ikkje, slik plateselskapsnamnet skulle tyde på, akkurat vore på skattejakt i dei mest dyrebare delane av eige låtkammer. Best er faktisk eit par av spora dei har komponert i fellesskap. Den strengefine og vagt vemodsfulle No Tears Tonight, der karane er rett så sjølvransakande i høve til sine prioriteringar og spesielt sin entusiasme for musikken; “but we both know that I got nothing, spent too much time playing in bands”. 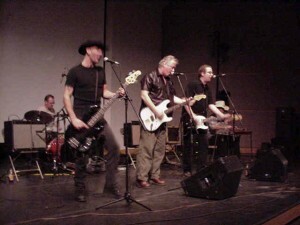 Og ikkje minst den friske countryrockabilly-låta The Inca Princess. Her får ein verkeleg ei kjensle av at dei er på eit felles oppdrag med fokus på å skape noko minneverdig. Det går sikkert an å hevde at begge har latt den andre parten sin karma få komme inn og røre litt ved sine vante vendingar. Til dømes så er Buckner si røyst og hans elegiske vesen ein sentral part av den tålsame Langford-låta Nothing to Show. Og Langford kan på si side kanskje ha inspirert Buckner til å dra fram ei såpass oppstemt (til han å vere) låt som Sweet Anybody. Men hovudinntrykket er nok likevel at Buckner sine låtar er skodd over Buckner-lesten og blir gjort på Buckner-vis, og Langford vice versa. Det er neppe ei plate å oppsøke for nykomarar i Buckner og Langford sine sirklar. Då er det nok meir fornuftig å få fingrane i før nemnte Devotion + Doubt, og kanskje Mekons-albumet Rock n’Roll. For kjentfolk derimot er det sikkert eit album som kan vere kjekt å ha. 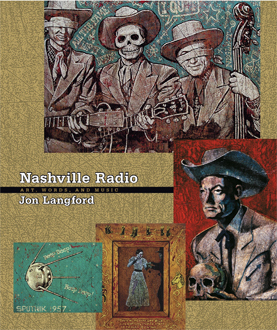 Copyright © 2010 Jon Langford. All Rights Reserved.